Suspended Deputy National head of Public Prosecutions Advocate, Nomgcobo Jiba has insisted that her only income is derived from the National Prosecuting Authority (NPA) and she has also denied ever receiving bribes from politically linked company, Bosasa. Jiba was responding to evidence by advocates Willie Hofmeyr and Glynis Breytenbach at the Mokgoro Enquiry in Pretoria. Former Bosasa Chief Operations Officer Angelo Agrizzi recently testified at the State Capture Commission that he paid Jiba and Lawrence Mrwebi substantial bribes to protect his company from prosecution. Jiba testified that her salary only comes from the NPA. She told the enquiry that she never befriended late former police commissioner, Jacky Selebi. Selebi was in 2010 convicted of fraud and corruption that relate to his alleged corrupt relationship with businessman Glen Agliotti. Jiba has taken the stand as the sixteenth witness at the Mokgoro Enquiry. She was being led by her legal advisor, Thabani Masuku. Suspended National Prosecuting Authority senior advocate, Lawrence Mrwebi has reiterated his claim that there was no sufficient evidence linking former head of Crime Intelligence Richard Mdluli to fraudulent car purchases. Mdluli was in 2012 accused of purchasing luxury cars for himself, his wife and his girlfriend using the police’s secret fund. Mrwebi has been fingered by previous witnesses before the Mokgoro Enquiry in Pretoria of unlawfully withdrawing charges against Mdluli. The Mokgoro Enquiry is considering the fitness of Mrwebi and colleague Nomgcobo Jiba to hold office. 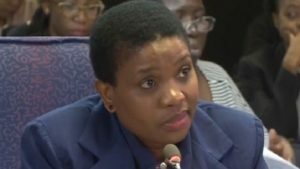 The post Jiba insists her only income derived from NPA appeared first on SABC News – Breaking news, special reports, world, business, sport coverage of all South African current events. Africa's news leader..